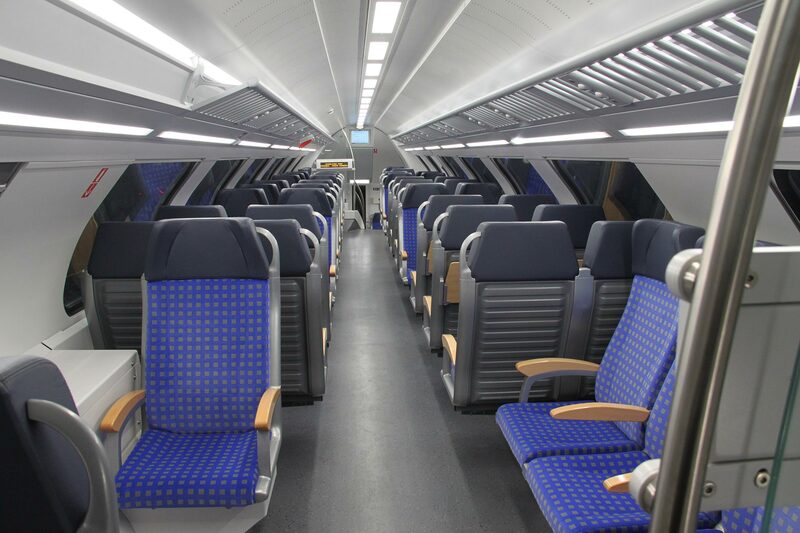 New, comfortable, modern passenger coaches. Less delays. Faster trips. More trains. You want these things. Metra has a plan to make them happen, and it’s asking Springfield for $5 billion to buy new equipment and upgrade tracks and stations. Sign our petition to tell Gov. Pritzker and the General Assembly you want a better Metra! Tell Springfield that you want modern Metra trains! Chicago is the heart of Illinois’ rail network, and Metra’s commuter rail service forms the critical veins and arteries. 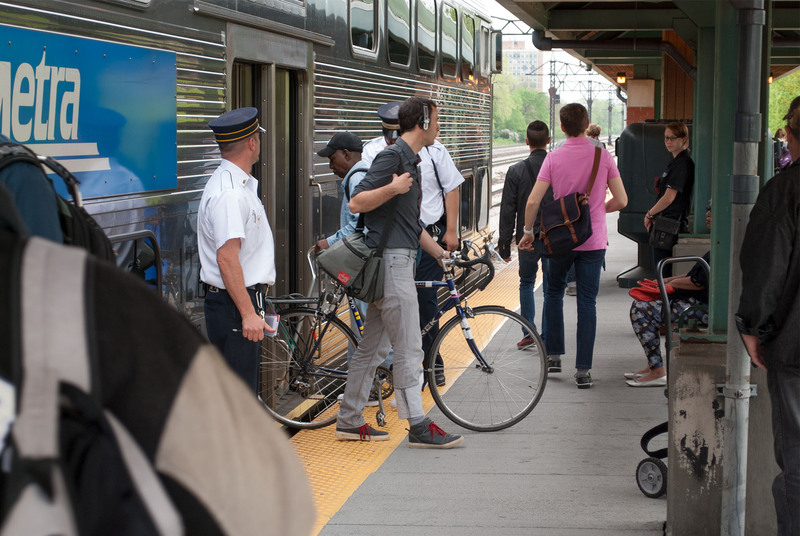 Building a statewide network of fast, frequent and reliable trains starts with improving Metra. In addition to basic maintenance projects—like replacing bridges, many of which are more than a century old—Metra is proposing to improve and expand its service. In many cases, the track upgrades Metra needs would also make it possible to run more fast, frequent trains around Illinois and the Midwest. 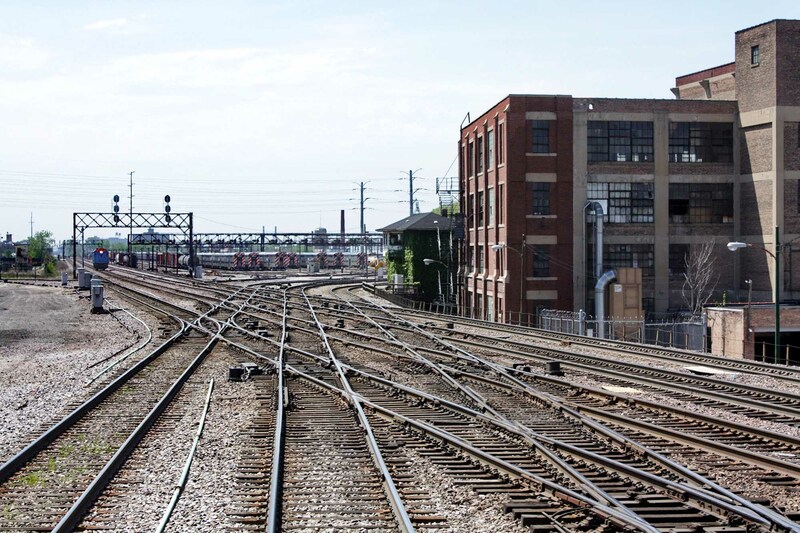 The Illinois Fast Track Initiative's statewide transportation plan would incorporate Metra's goals and multiply their impact by integrating and coordinating them with dozens of other projects statewide. This comprehensive view justifies a more aggressive approach, accelerating funding and project completion. What does a better Metra look like? New train designs would give Metra the flexibility to offer frequent, all-day service. Today, Metra is focused on moving workers from Chicago’s bedroom communities to downtown at rush hour. It could do that better, but also be so much more. Metra should be a reliable option for people going all around the Chicago region, for all kinds of reasons, at all times. It could offer faster and more frequent service—trains as often as every 15 minutes on some routes—to make it a truly convenient and easy way to get around. 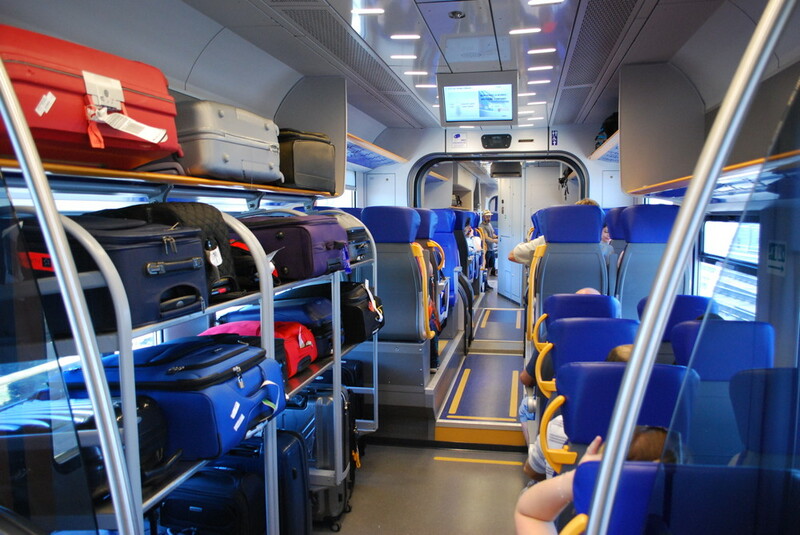 Modern commuter coaches have lower floors for easier, faster boarding. They can have two full levels, with more seats and dedicated space for bikes and luggage. Before it can run faster and more frequent trains, Metra needs new equipment. Half of its fleet is at least 40 years old. The passenger coaches are a design that hasn’t changed much since the end of World War II—and some of them are actually that old. 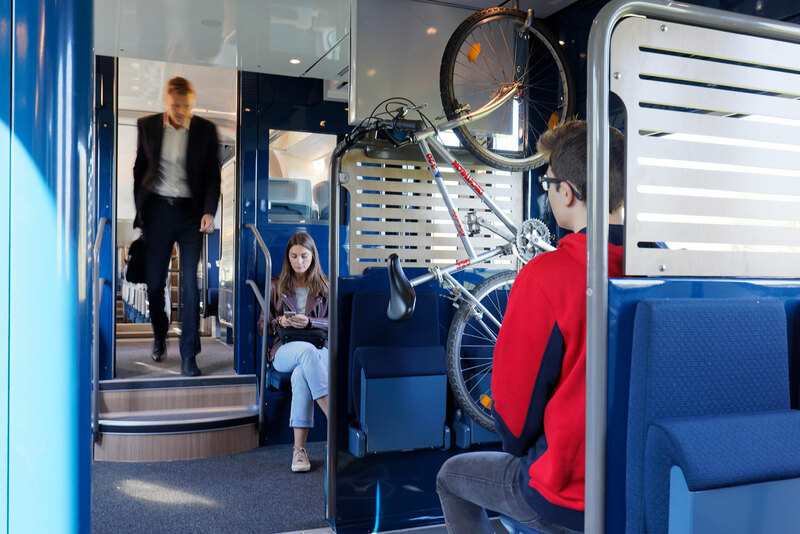 Modern passenger coaches hold more people, are easier to get on and off of, and have space for luggage and bikes. They are lighter, meaning trains can start and stop faster, and also safer. 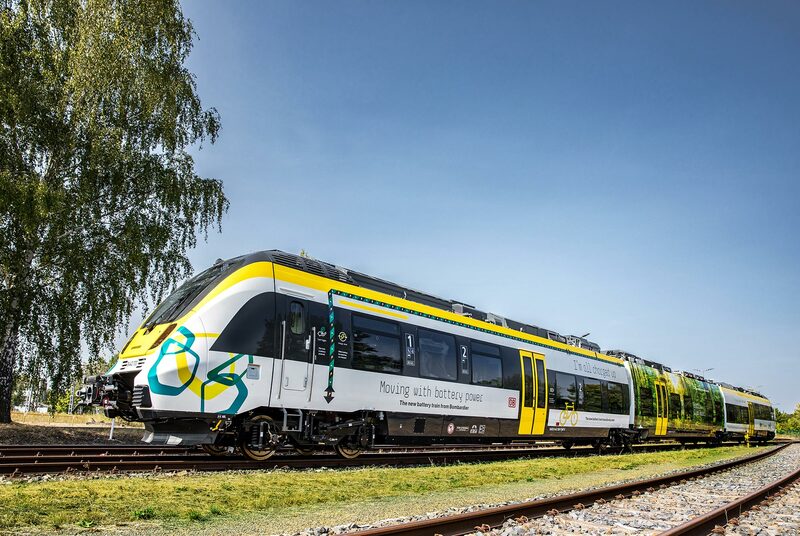 New locomotives would be faster, use less fuel, be more reliable, and produce as much as 86% fewer emissions. Metra should also consider “multiple units,” trains where the passenger cars propel themselves without needing a locomotive, for certain services. Multiple unit trains are less expensive to operate and a good way to run more frequent service during off-peak hours. Ready for a better Metra now? Metra's airport service could use a new train design and interiors designed for air passengers. Metra is proposing to offer express trains from Union Station and/or Ogilvie Transportation Center directly to O’Hare—a trip that will take about 30 minutes. 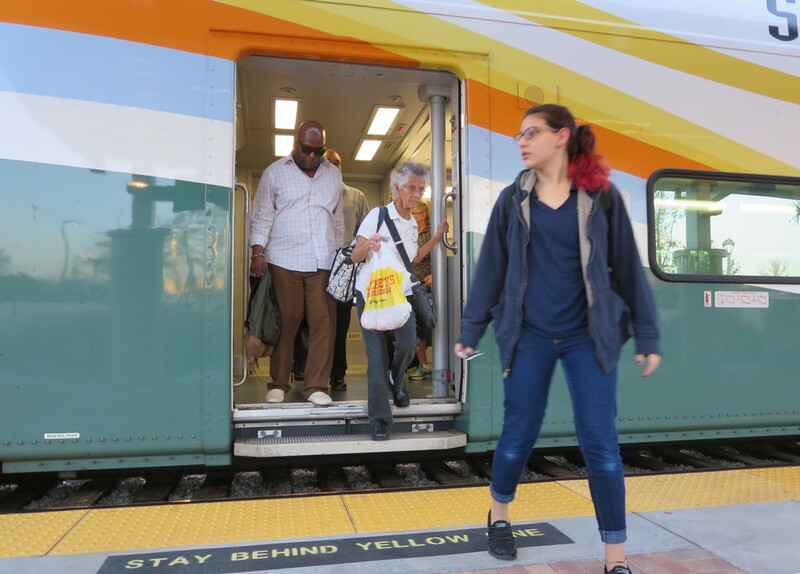 The service could use a new type of train, with easier boarding and luggage racks. The project is a less expensive and more immediately viable alternative to the O’Hare tunnel proposed by Elon Musk’s Boring Company. Any required infrastructure investments could benefit other Metra and Amtrak service, too. A better Metra relies on a number of track upgrades. A-2 and 75th Street are two of the most important. See a full list of track projects here. Near downtown Chicago, there’s a crossing called A-2 that is one of the busiest and most complicated rail intersections in North America. About 350 trains cross paths at A-2 each day, carrying more than 50,000 Metra passengers and 3,700 Amtrak passengers to and from Union Station and Ogilvie Transportation Center. This critical junction is badly outdated in more ways than one. The equipment that controls it must be hand-operated, and it dates to the 1930s. But the bigger problem is simply that trains must slow down and wait their turn to pass. A “flyover” would eliminate the bottleneck and allow trains to travel faster and pass the junction without stopping. That solution would be a big plus for commuters, since the flyover would allow Metra to expand service and reduce delays. But the benefits would go well beyond Metra. A flyover would also create better options on Amtrak, which is planning more trains from Chicago to Milwaukee. And it will clear a path for express service to O’Hare, along with high-speed trains that improve access to destinations all over the region. A flyover at A-2 would not only make life better for everyday Chicagoland commuters, it would improve train travel around the Midwest. The 75th Street CIP is a major, much-needed improvement to one of the most congested railroad intersections in the nation. Delays at this junction impact freight and passenger trains nationwide. The $474 million first phase brings together federal, state, and local agencies to create a flyover that eliminates a chokepoint where east-west tracks cross north-south tracks. The intersection slows down both trains and drivers, resulting in more than three hours of daily traffic delays. The idling trains and cars are a significant source of pollution in the region. The flyover promises huge benefits for Metra, Amtrak, and freight train companies. Metra, for example, runs 30 trains through the corridor daily, so its service will be more reliable—and faster. 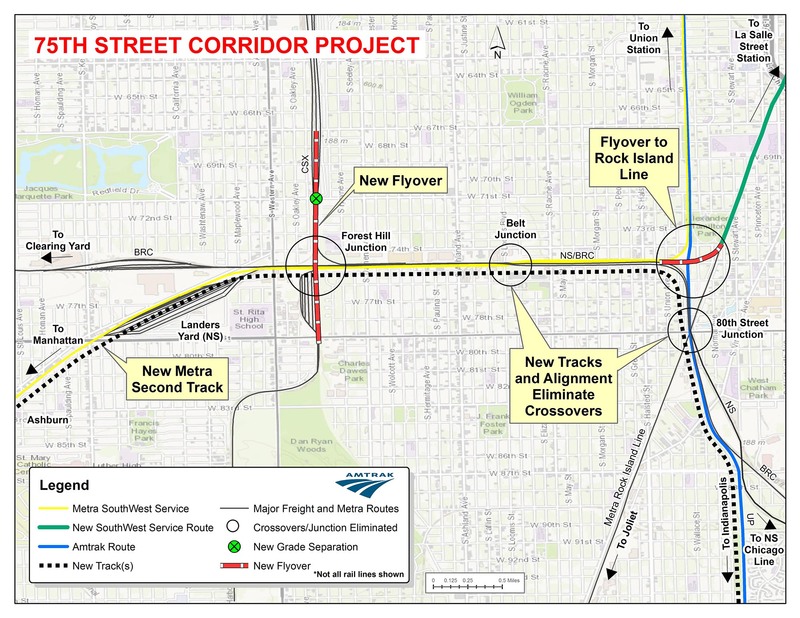 The flyover will save Metra riders moving through the corridor an estimated four minutes per trip.The first phase also funds the design stage for eliminating another bottleneck at the junction, where five tracks merge into two, and for creating a second flyover for Metra’s Southwest Service. Work on the 75th Street CIP begins in the spring of 2019. Its full cost is expected to be about twice the $474 million secured to date. Metra's Electric line was designed to offer frequent, all-day service to its dense stations. Metra's Electric line was designed to offer frequent, all-day service to its closely-spaced stations. There is no freight traffic to dodge. With some track upgrades, Metra could restore frequent, all-day service to all of the Electric line's branches. Metra’s Rock Island line also has closely-spaced stations and little freight traffic, making it another great testing ground for faster and more frequent service that could later be applied across Metra’s system. Metra's Electric and Rock Island services within the City of Chicago suffer from relatively high fares and infrequent trains. Simply lowering prices to match CTA fares and offer transfers with CTA and Pace would increase ridership by 33%, according to a study conducted by Cook County. 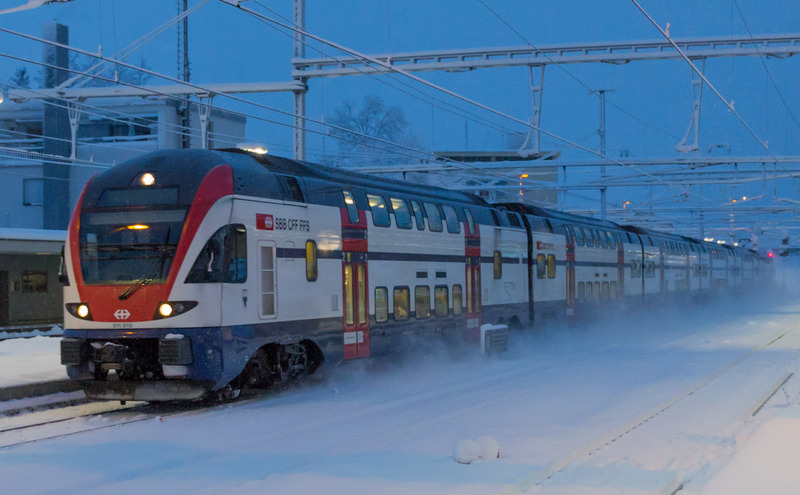 Adding frequent trains would make the service convenient and even more popular. Tell Springfield to invest in Metra!